Experimental aerospace firm SpaceX successfully launched its Falcon 9 rocket from Florida after two planned attempts were scrapped earlier in the week. However, it canceled plans to test land the reusable rocket on a Florida barge. 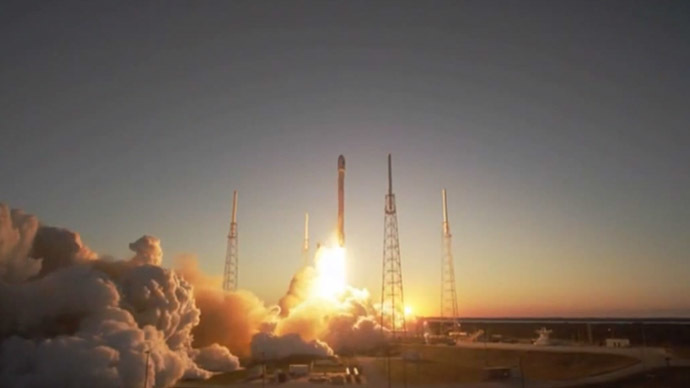 The Falcon 9 rocket blasted off from the Cape Canaveral Air Force Station shortly after 6 p.m. local time Tuesday evening after radar issues and weather problems prompted Elon Musk’s SpaceX company to postpone launches on Sunday, then Tuesday this week. The launch was expected to be SpaceX’s second attempt to test its plan to create reusable rockets that could land back on the ground rather than plunge into the ocean, but poor weather conditions put an end to that idea. The initial plan was for the first stage of the Falcon 9 rocket to come back down to Earth and land safely on a barge near the coast of Florida, but instead the rocket attempted a "soft landing" into the water, where it is unlikely to be recovered. Onboard the rocket is the Deep Space Climate Observatory, or DSCOVR, a National Oceanic and Atmospheric Administration (NOAA) sanctioned satellite that is expected to soon begin collecting information on solar storms and how they affect communication and power systems on planet Earth. If successfully put into orbit, DSCOVR could be "the first line of defense...for us to be able to take the appropriate action to protect our system from any impacts that could happen,"David Velazquez, executive vice president of energy company Pepco Holdings Inc., said in a NOAA video. First, however, scientists will need to get the satellite in place. It is expected that DSCOVR won’t begin orbiting until it travels for around 110 days through space to a position, Lagrangian Point 1, which will place it between Earth and the Sun. "The L1 position will provide DSCOVR with a point of 'early warning' when a surge of particles and magnetic field from the sun will hit Earth," NASA said in a statement.